Women are greatly concerned over the question of storing clothes. Besides, the majority of women have lots of accessories like belts, scarves or jewelry. So, all these items have to be stored in order. In this review, you can find 10 tips, allowing you to organize a closet perfectly. Pay attention to these ideas, choosing your closet. They will help you avoid many mistakes. Frequently, people make mistakes choosing the length of rods and as the result, they face the problem like where to keep clothes. Everything depends on your needs. If you frequently wear tailored suits, your rod should be longer. A vanity is an integral part of any closet for women. Designers recommend adding a vanity area on the top of the drawers. Sometimes, to provide a vanity, the drawer space is sacrificed. 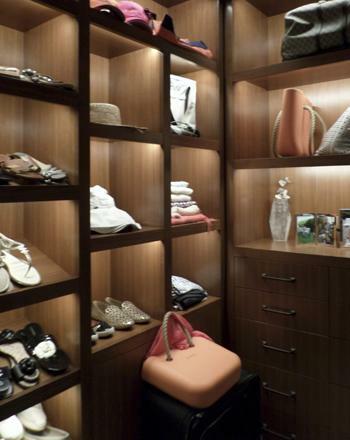 A perfect women’s closet is not only well equipped, but well illuminated as well. If the closet has enough light, you will find the things you need faster. Usage of vertical space allows you to forget about the chaos in your closet. So, if you have enough space, fix two rods. This is an integral part of any closet for women. 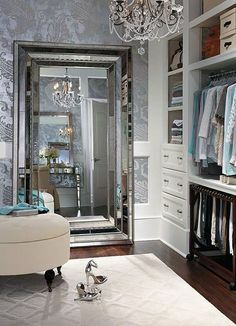 Hang a full-length mirror and choose your everyday outfit in a comfortable environment. If a closet is designed for women, decorations should be applied. Everything depends on your taste and budget. However, even correctly chosen rugs and wall decorations can change the look of a closet. As far as the process of choosing an outfit can be tiring, you should choose a sofa, ottoman or a small bench for your walk-in closet. This is the main rule of creating a perfect closet for women. Even if you haven’t an appropriate room in your house, but have an awkward attic space, you can create an awesome walk-in closet there. You just need to think outside the box. Following this advice, you will have more space to keep clothes. Don’t forget about corners – they are not a dead zone. It is possible to fix a custom corner hanging there and use this space rationally. Probably you have several personal items you wish to keep in your walk-in closet. It can be family photos, jewelry or some other collections. Following this tip, you will want to spend more time in this room.